In November, 2011, the delinquency rate for business credit cards finally fell to levels they were before the recession hit. Many remember that both 2008 and 2009 saw “skyrocketing” delinquencies in businesses of all sizes. Looks as though today’s business owner is finally past those difficult times – for the most part, anyway. Any business owner will tell you there’s never a shortage of business credit card offers; in fact, some companies receive many offers every week. Which ones are the best, though? And what things should a company be looking for in its business credit card? This week, we take a look at the many offers – including the Plum Card from AMEX, the Gold Delta SkyMiles and the Business Gold Rewards Card from American Express. This credit card offer is part of the American Express OPEN program. Business owners earn 30,000 bonus miles after spending just $500 in their first three months of membership. This equates to a free flight. Not only that, but on every Delta flight booked with your AMEX, business owners have their first bags checked free – and that goes for up to eight people who are traveling with you. This co-branded credit card offer also allows for double miles for all your Delta purchases, priority boarding and 20% in-flight savings. The $95 annual fee is waived your first year, making this a good choice for business owners of all sizes. Touted as the “Everything, Everywhere Trade Terms Card”, there’s much to appreciate about the Plum card. For those who pay their balances in full in month and within 10 days of receiving their statement, they earn a 1.5% discount. For bigger balances, you can pay at least 10% of the balance and then take an additional 2 months to pay the remaining balance – and it’s interest free! There is a $185 annual fee associated with this credit card offer; however, it’s waived your first year. Also, as part of the OPEN Network, card holders can take advantage of the many financial management tools offered by American Express. 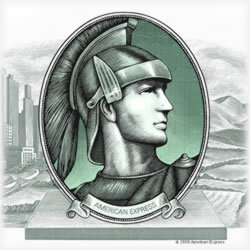 Recently revamped, this AMEX offer allows business owners to earn more points faster, including three times the points on airfare and double points for your advertising, fuel and shipping charges. One point per dollar spent applies to all your other charges. With more than 500 brand participating in a program that has more than one million rewards, you can be sure this is a strong network. With no limits on how much you can earn, no worries about expiration dates and a growing network, your potential really is limited when you choose this credit card. The $175 annual fee is waived your first year. Also, with twenty four hour, 365 day access to an account executive, you know there’s always someone there when you need them. Want to add additional credit cards? No problem – add as many as you’d like for an additional $50 each year. Your annual fee is waived the first year for these additional cards, too. So which of these offers is the best? As you can see, each brings to the table an impressive number of perks and benefits. Perhaps the biggest variations are found in the annual fees. The Plum card has the highest while the $95 annual fee associated with the co-branded card is the lowest. You’ll want to consider more than just that, of course. It really comes down to which program you’re most apt to benefit from. For those who spend a lot eac year on advertising and office supplies, the Gold Rewards Card might be the better offer; while those businesses that have a lot of travel each year, it stands to reason the Gold Delta SkyMiles is the stronger contender. If paying the balance in full each month is no problem, the discount associated with the Plum card is worth a second look. Either way, be sure to carefully review the terms and conditions before you apply for any credit card offer. Being informed is still the best move any business owner can make for the well-being of his company.